CHILDREN can go sailing in a pirate ship, climb imposing cliff-faces and keep an eye out for enemies from watch towers at two newly updated playgrounds in Austinmer. The playgrounds, at Pinecourt Park and Austinmer Beach Reserve, have been upgraded to bring the equipment in line with Australian safety standards, while maintaining a strong sense of sea-side fun. 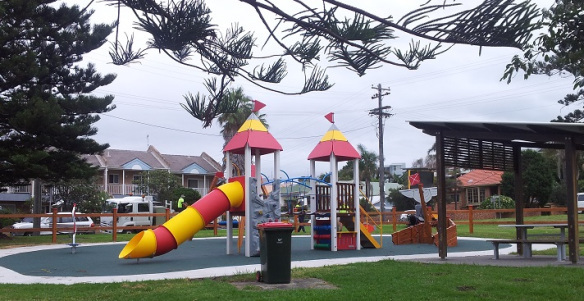 High quality playgrounds – such as the spider climbing frame at Austinmer Beach – were favoured over quantity of playgrounds by the community and Council in the Play Wollongong Strategy 2014-2024,adopted two years ago. “Play is crucial in developing kid’s health, friendships and problem solving capabilities,” Mark Bond, Recreation Services Manager said. This financial year, Council has budgeted over $1 million for playground maintenance, upgrades and replacements. “Keeping kids active, inquisitive and entertained is a full-time job and we know playgrounds hold sentimental and current value for both kids and adults. “Council’s Play Wollongong Strategy is dedicated to finding the balance between replacing and removing old equipment while still delivering the fun playgrounds our community expects. Over the next 10 weeks, Council has a number of key playground renewals scheduled for completion. These include Otford Road Reserve at Otford.